At Freedive Panglao we offer a range of Freediving Courses from beginner up to professional levels. If you want to improve specific skills or disciplines we also offer individual training sessions and coaching tailored to your needs. 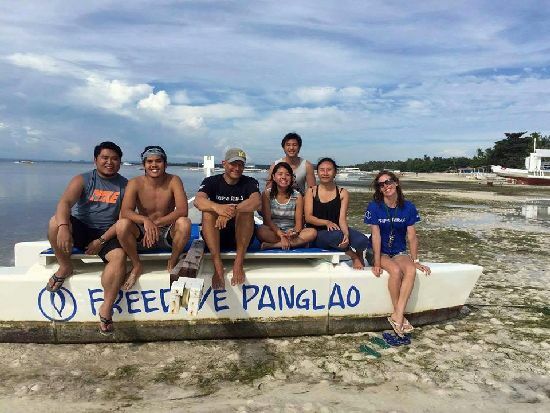 We have a group of very experienced freediving instructors that are ready to take care of you. By reading the details you can inform yourself about course length, pricing and content. The price for the AIDA courses includes equipment, manual and certification. If you have no experiences snorkeling or diving the AIDA 1star Freediver will open your mind to a whole new underwater experience. You will learn some basic theory of Freediving and how to prepare yourself for a breathold dive including breathing, duck dive, finning, buddying and safety techniques. This is probably the most challenging and rewarding AIDA course. For those who are already confident in the open water this course is your starting point. 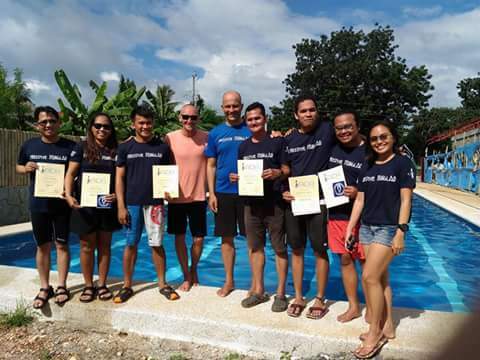 The course builds a foundation of good technique and safety so that you can buddy with other AIDA 2 star freedivers. This course consists of two theory sessions, two pool session and three open water sessions. interested in going deeper and improving your technique? this course goes into the theory of freediving in more depth which will allow you to understand the physiology and techniques behind diving deeper. the course will help you improve your freediving performance whilst advancing your safety and rescue skills. this course consists of three theory sessions, two pool sessions and four open water sessions. this course takes you to a whole new level of confidence in your freediving. not only will you learn the latest techniques for deeper diving but you will also learn more about conditioning your body for freediving. this course will push you to the limits of your freediving abilities. the aida 4 star is the highest level a recreational freediver can achieve. the aida 4 star can be combined with the competition freediver course for those who want to explore the challenge of competitive freediving. this course consists of three theory sessions, two pool sessions and four open water dives. For the pool part of our courses we use our 25m pool, specifically built for freediving. Stefan and John with a group of local students. This course was donated trough KAPID SISID in order to help and and empower Filipinos to protect their marine resources through safe freediving. Now that you have gained so much knowledge and skills on your Freediving journey, you might want to take things one step further and start helping others do the same. 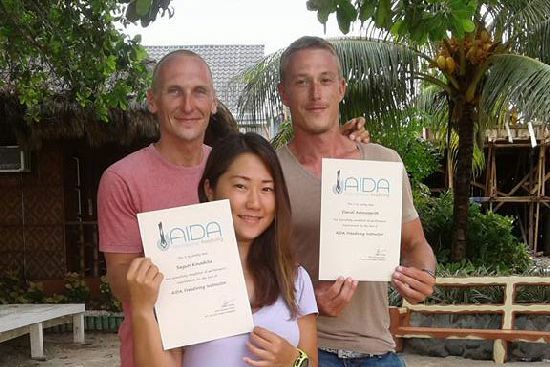 The AIDA Freediving Instructor Course is a very intensive course and is usually run over a 8 - 10 day period and involves nearly 40 hours of instruction! You will have to prove your endurance and be able to comfortably dive to 40 meters and hold your breath for over 4 minutes. However the rewards are great - you could ultimately make a living from something you have come to love. Already instructor for another agency? 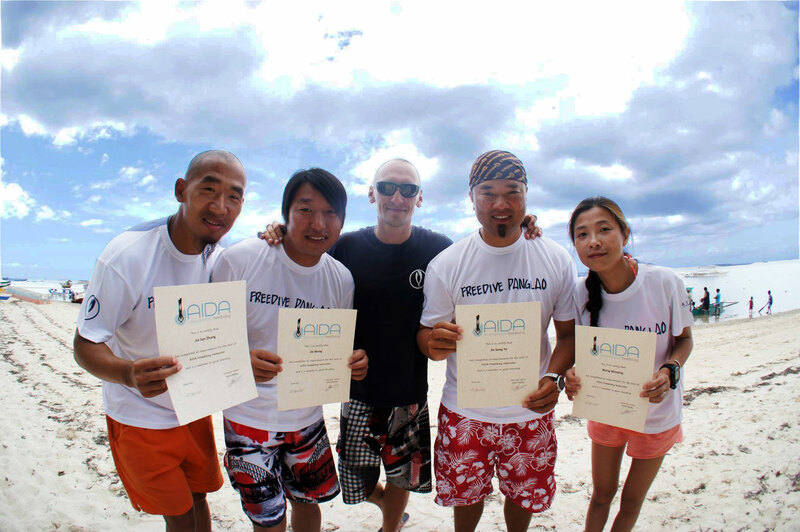 If you are already an Instructor of a Freediving agency and wish to crossover to AIDA, we offer a crossover program. The course is 4-5 days, includes all standards specific to AIDA and will prepare you for teaching AIDA courses. Stefan with two of his instructor students: Daniel Arrowsmith and world record holder Sayuri Kinoshita. Stefan with Jojo, Zuodao, Polly and record holder Sendoh, some of the first Chinese Instructors back in 2014. Learn to master this advanced equalization technique with dry equalization exercises and open water training. Includes diving on Functional Residual Capacity (FRC). Participants must have an AIDA 3star / SSI level2 (or equivalent) certification. Duration of course depends on experience of participant. Learn to provide solid safety for your diving buddy in this one-day course. Only depth disciplines. Participants must have a AIDA 2star / SSI level1 (or equivalent) certification. Learn the special technics and handling of the monofin.